Lully’s Armide is pretty much the archetypal tragédie en musique. It features an allegorical prologue praising Louis XIV’s multiple virtues, delivered as a dialogue by La Gloire and La Sagesse followed by five acts based on the Armida/Rinaldo story from Tasso. There are also, of course, lots of ballet interludes. As such, it isn’t all that easy to stage for a modern audience. 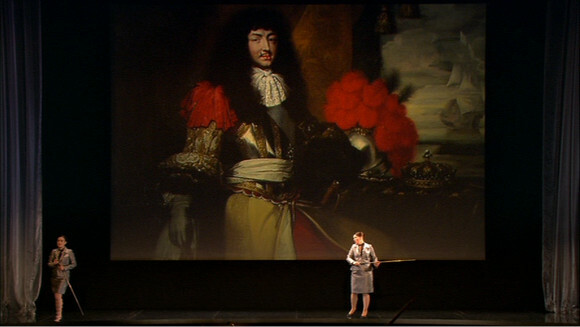 Robert Carsen and William Christie’s approach for their 2008 Paris production is to frame the story in the context of Versailles. 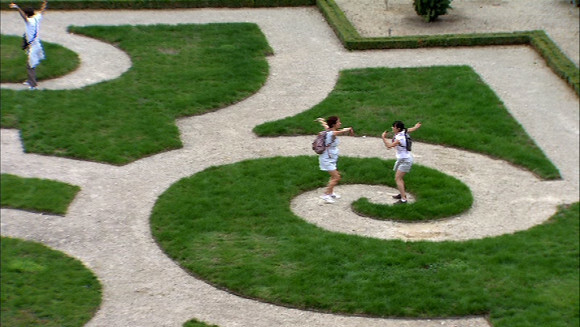 During the overture we see groups of “tourists” infiltrating the theatre prior to a guided tour of Versailles. The prologue itself is staged with two tour guides singing didactically while sundry giant portraits of Louis are projected. We then morph to a ballet scene in the various rooms and gardens at Versailles (presumably this was shown as a film in the theatre) finishing up with “Renaud” sneaking into the king’s bed for an illicit nap. Presumably the story that follows is a dream because the action closes with “Renaud” being discovered by security and thrown out. In between the story of Armide and Renaud is rather elegantly presented in a mixture of silver grey and bright red with some deft and, often, very Carsen touches. 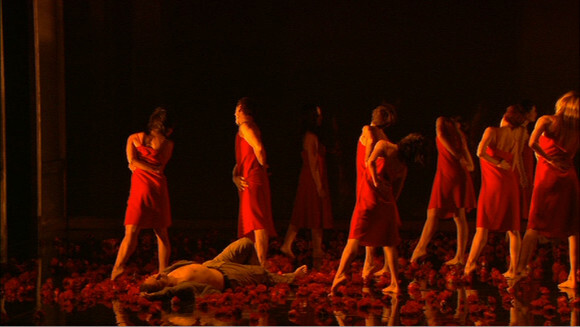 La Haine is Laurent Naouri in a little red dress, there are some signature Carsen flowers in Act 2 and the seduction/deception of the two knights in Act 4 is very cleverly done. The trouble is that, good as the staging is, it can’t really overcome the essential dullness of the music. The one real highlight is Stéphanie Oustrac’s Armide, who injects some actual emotion into the piece (and it’s sorely needed). The performances are fine. Oustrac is outstanding and she’s well backed up by Paul Agnew’s Renaud. All the allegorical figures are fine and the chorus is excellent. It’s Christie’s own Les Arts Florissants in the pit so no issues there. The choreography by Jean-Claude Galletta is lively and well danced by members of the Centre Chorégraphique National de Grenoble and the Groupe Emile Dubois. It’s well produced for disk too. The video direction by François Roussillon is adroit. We see the full picture but he does focus in, especially on Oustrac, which is just fine with me. Some of the darker scenes challenge the decent quality DVD picture but may look better on Blu-ray. The DTS surround sound is also fine. Documentation includes a detailed track listing and a synopsis. Bonus material includes useful interviews with many of those involved. They are all in French and allow one to hear Robert Carsen’s near perfect Toronto French. Subtitle options are french, English, German, Spanish and Italian. This really is well done and Lully lovers will probably be delighted. Others may, like me, find it easier to admire than enjoy. Oustrac really is the deal here, so here’s a bonus picture. This entry was posted in DVD review and tagged agnew, carsen, centre nationale choregraphique de grenoble, christie, dvd, groupe emile dubois, les arts florissants, lully, naouri, oustrac, theatre des champs elysees by operaramblings. Bookmark the permalink. I really liked Oustrac in this too – she seems to turn up in a lot of French opera, but not much else (at least on DVD) which seems like a shame, since she can certainly sing. She is really good. Not sure why she’s not more widely known. She’s sung pretty much everything across the lighter lyric mezzo spectrum it seems but only the French baroque stuff has made it on to DVD. I would like to have seen her Carmen.